Charlie Jones, Founder of Kitchup, a kitchen sharing platform, worked at Startup Direct as a business support. His business, now also allied to his twin sister Emma, grows from strength to strength. Laura Campbell of Startup Direct caught up with him, to find out how working with a start-up business helped him set up his own business and the key lessons he learnt that any other new start-up can master and emulate…..
1) Hi Charlie! What did Startup Direct teach you about starting up a business and the different types of funding for startups? I’ve always enjoyed the networking side of business, and organising mentoring sessions and events at Startup Direct really reinforced the value of making new connections and building a network. It’s particularly important for startup businesses and has been crucial in the development of my business, Kitchup. When starting a business, you’ve got limited budget and resources so networking is a free way to raise your profile, generate referrals, gain advice and open up opportunities you wouldn’t have had otherwise. Never underestimate the value of networking, even if you spend time talking to someone who isn’t directly related to your business or in your industry, you never know who they might know or when that connection might come in handy! 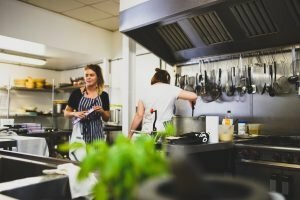 I was working for Startup Direct advising on startup business loans and in particular, food startups, when I noticed that their biggest challenge was finding kitchen space to grow their business. When trying to help them in their search for space I found the process time consuming and expensive. Commercial property isn’t a viable option for many startups, it lacks the flexibility that’s needed for early stage businesses and the high up-front costs associated with buying your own premises and kitting it out are unrealistic. There were lots of websites to help you find office space or venue hire, but nothing offering support to food businesses in need of kitchen space. Online listings were sparse and fragmented and there was also a lot of uncertainty and inconsistency with what information was provided. So, there was a risk of wasting time looking at kitchens that weren’t suited to your operations. I soon realised that there were lots of kitchens that weren’t being used to their full capacity, in catering companies, coffee shops and public buildings. 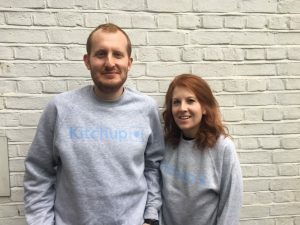 This is what spurred me to set up my startup, Kitchup in 2015, the UK’s first online marketplace for kitchen space. Through our platform, we help match underused kitchens with food businesses looking for space to hire and bring more simplicity, flexibility and choice to the industry. 3) What issues have you overcome since starting up your business? One challenge we faced when starting out was making businesses aware of this opportunity. 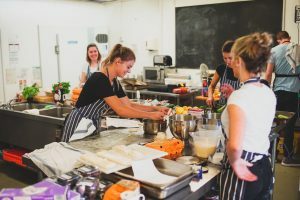 As it’s a new concept, not all kitchen owners known that their space is a valuable asset that could earn them extra income and help support a food business. Through building a supportive community, we managed to sign up a number of different kitchens and start a network effect. Word of mouth was very beneficial for us when starting out and once we explained the process to kitchen owners and how it works, it was a no brainer! 4) What successes have you had recently? Success for us, is when we match a food business with a kitchen and see their business grow. Recently, we’ve helped businesses find kitchen space last minute so they can fulfill an event commitment, find interim kitchen space to keep their operations running whilst they await to move into their own premises and find regular space to meet growing catering demands. The added bonus, is that we are helping to make valuable connections in the food industry, encouraging a more collaborative and resourceful community. We’ve got some kitchen users who have become great friends with their hosts and that’s really rewarding to see! Another recent highlight was my twin sister Emma Jones joining the team full-time. Starting a business on your own is challenging so having another committed member of the team who shares your ambition is invaluable! 5) Where do you see Kitchup in 5 years? It’s a very exciting time for Kitchup. We’ve had our experience with Startup Direct and startup loans scheme, a year’s worth of learning and feedback from our marketplace, proof of concept and now we’re looking at the next stage for the business, developing our tech solution and building the team. We have big plans for growth and in the next 5 years, I hope we will have expanded internationally, have a bigger team and support more people on their food journey, helping businesses thrive! Thanks Charlie, the whole team at Startup Direct wishes you continued success with Kitchup. If you are inspired by Charlie’s business, why not click here to complete a startup business application and see how you can turn your business idea into a reality?